We create the most natural looking, realistic hair strokes in eyebrow permanent makeup with Manual Microblading, also known as Eyebrow Embroidery. This technique allows us to create crisp, fine hair strokes that fill in thin brows, brows with bald spots, total brow reconstruction and even alopecia. Imagine waking up to perfectly groomed brows every day without having to worry about filling in, smudging, smearing or disappearing. We will customize the right eyebrow shade and thickness for you using a wide range of high quality hypoallergenic permanent makeup pigments and sterilized needle sizes. 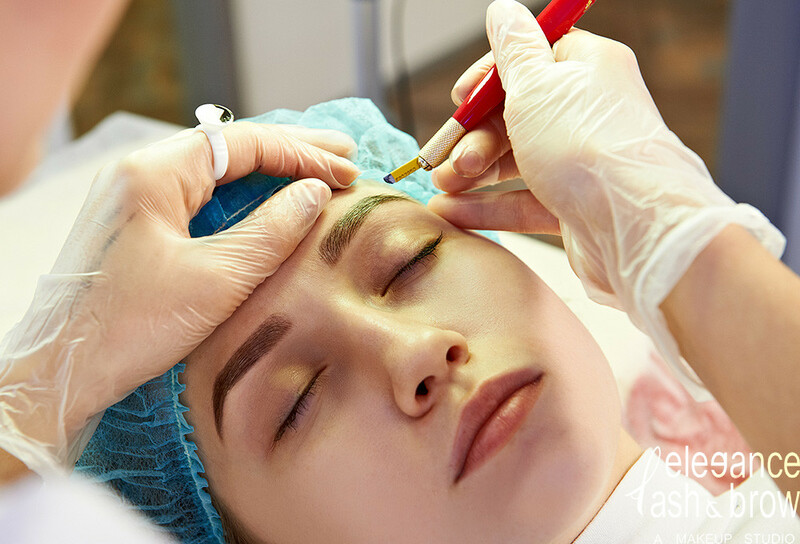 Before we begin the procedure, we sit down and work with you to shape your brows with a pencil, allowing us to agree on the best color and shape to fit your face. Microblading does not require your entire eyebrow to be shaved and does not damage your natural hair. To keep discomfort to a minimum, anesthetic creams are used before and during the procedure. The entire process takes only 2 hours and there is no down time. A touch up is required once 1 months after initial procedure. Pigment retention depends on skin type, age, aftercare, sun exposure, use of certain skin products, immune system, medications and other factors. Touch ups are recommended once a year to prevent natural fading. Please note Eyebrows will appear darker and bolder due to natural scabbing and healing for the first 7 days, it also will be lighter in second week! The real shade will appear on week 4! A touch up will be done by your technician after 4 weeks and it is included on first initial fee! To ensure best results, make sure your health is in good condition. Get enough rest, eat well, exercise. 72 hours before and after your Microblading appointment, avoid alcohol and aspirin/ibuprofen. One week before, stop taking the following supplements (Vitamin E, B6, Omega 3, Gingko Biloba, St. John’s Wort) as they contribute to thinning the blood and may affect anesthetic efficacy. You may resume taking your vitamins 72 hours after. On the day of your appointment, avoid caffeine and exercise. Wash your hair in the morning as you will need to avoid the shower for several days. Baths are recommended. Pigments during Microblading are not implanted as deep into the skin as a traditional tattoo, or even Microblading with an electric permanent makeup device. This allows for healed results of very fine, thin, and crisp hair lines, however, results do not last as long as traditional methods. A color boost is required usually between 18-24 months. A touch-up may be required at 12 months or sooner for oily-skinned clients, those who tan often, or often expose brow area to certain chemicals (facial peels, chlorine, anti-aging products, etc.). Pigment retention varies depending on skin type, age, aftercare, immune system, medications, certain chemicals, and the type of pigment used. We use only the best quality pigments that heal true to color. All materials used during each and every appointment (including pre-sterilized blades) are 100% disposable. We strictly adhere to both Texas Public Health and OSHA guidelines for proper infection control practices. Microblading is a two-step process, consisting of initial procedure and a touch up to be completed 4-8 weeks after. This method is a lot kinder to the skin than the old method done with a machine. Redness and swelling dissipate within an hour after the treatment and no permanent scarring takes place. During the healing process, your brows will go through a very interesting ride – at first, they appear dark and well defined. After about 7 to 10 days, the color will fade slightly and the definition will soften. There’s no down time, so there’s no need to take a day off work. Scratch, pick, scrub will STRONGLY not recommended. Brow shape, color, and shade may change, 2nd or 3rd session is required for completion depending on skin condition. Final result may take up to 5-10 weeks, your patient is strongly recommended! If you have any more inquiries or questions, please contact elegance lash and salon and talk to your technician. It is essential that you follow the instructions after your Microblading session as directed in printed paper handed to you by your technician. Apply the post-care cream with a cotton swab as needed (This is several times a day to ensure proper healing.) Do Not use aggressive movements while applying the post-care cream. Wash your hands before any contact with your brows to avoid infection while they are healing. Touching of the microbladed areas except for rinsing and applying the post-care cream with a cotton swab. Let your eyes say it all for you! With permanent eyeliner and permanent eyelash enhancement, you can look beautiful all day with freedom from eye makeup.